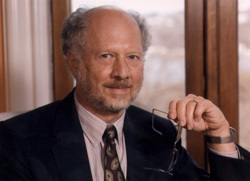 Joseph F. Traub is the Edwin Howard Armstrong Professor of Computer Science at Columbia University and External Professor at the Santa Fe Institute. Dr. Traub has held positions at Bell Laboratories, Carnegie Mellon, and Columbia, as well as sabbatical positions at the University of Washington, Stanford, Berkeley, California Institute of Technology, and the Technical University, Munich. He has been involved in the building of two major Departments of Computer Science and is the author or editor of ten books and some 120 papers. In 1959 he began his pioneering work in what is now called information-based complexity. His current research focus is on quantum computing. Both his research and administrative work have had a major impact on the field of computer science. Joseph Traub was born in Karlsruhe, Germany in 1932. He and his family barely escaped the Holocaust by immigrating to the United States in 1939. Traub attended the Bronx High School of Science and City College of New York, majoring in physics with a minor in mathematics. He received his Ph.D. in applied mathematics from Columbia in 1959. In a series of interviews conducted by William Aspray for the Babbage Institute in the 1980s, Traub described his discovery of computers as a fortuitous accident. In 1955, on the advice of a fellow student, Traub visited IBM’s Watson Laboratory at Columbia. At the time, Watson Lab was one of the few places in the country doing computer research. Traub found that his proficiency for algorithmic thinking matched perfectly with computers and he did not return to his pursuit of physics. In 1957, Traub became a Watson Fellow through Columbia, and throughout his thesis research he had unlimited access to the IBM 650. His thesis was on computational quantum mechanics. In 1959, Traub began working at Bell Laboratories in Murray Hill, New Jersey in their Mathematics Research Center. He transferred to the Computer Science Research Center when that was created. In 1966, he spent a sabbatical semester at Stanford University as a visiting Associate Professor of Computer Science. In 1971 he began conversations with Alan Perlis, head of the Carnegie Mellon University Computer Science Department, regarding the department’s search for a new leader. Traub visited Carnegie Mellon and was offered the position. The department at the time was quite small, including Gordon Bell, Nico Habermann, Allen Newell, Raj Reddy, Herb Simon (who, through an agreement with Newell, was more affiliated with the psychology department), and William Wulf. Just prior to1971, many faculty members had left the department to take positions elsewhere. Those professors who remained formed a core of world-class scientists recognized as leaders of the discipline. Upon joining Carnegie Mellon, Traub worked with other faculty to recruit new faculty and to diversify research funding. In his first year, the Computer Science Department recruited such people as Samuel Fuller and Daniel Sieworiek. A student-faculty committee did a major revision of the Ph.D. program. By 1978 the department had grown to some 50 teaching and research faculty. In 1978, he took a sabbatical from Carnegie Mellon and spent the year at the University of California, Berkeley. While at Berkeley, he met Peter Likins who was then Dean of Engineering at Columbia. Their conversations, over a period of several months, led to Traub leaving Carnegie Mellon in 1979 to establish the Computer Science Department at Columbia University and to become its founding chairman, a position he held until 1989. He served as founding chair of the Computer Science and Telecommunications Board, National Academies, 1986-1992 (currently he is again serving as chair). He started the Journal of Complexity in 1985 and has served as Editor-in-Chief since. Traub has received numerous honors including election to the National Academy of Engineering in 1985, the Emanuel R. Piore Gold Medal from IEEE, and the 1992 Distinguished Service Award, Computer Research Association. He is a Fellow of the American Association for the Advancement of Science, the Association of Computing Machinery, and the New York Academy of Sciences. He has been Sherman Fairchild Distinguished Scholar at the California Institute of Technology, and received a Distinguished Senior Scientist Award from the Alexander Van Humboldt Foundation. He was selected by the Academia Nazionale dei Lincei in Rome to present the 1993 Lezione Lincei. Traub received the 1999 Mayor’s Award for Excellence in Science and Technology. The Award was presented by Mayor Rudy Giuliani at a ceremony in New York City. In 2001 he received an honorary Doctorate of Science from the University of Central Florida. He has two daughters, Claudia Traub-Cooper and Hillary Spector. He lives in Manhattan and Santa Fe with his wife, noted author Pamela McCorduck, whose books include Machines Who Think, The Fifth Generation, The Universal Machine, Aaron's Code and The Futures of Women.